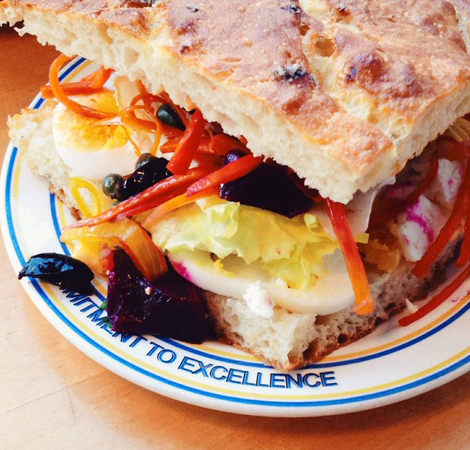 From tuna melts to Italian subs, there's a vast world of sammies to explore. Let's get started. 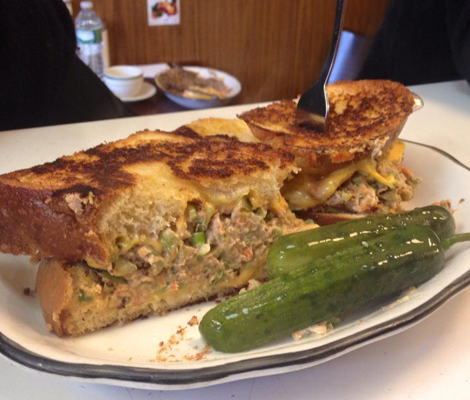 The sandwich, it seems, has always existed on the edge of an existential crisis—at once both a perfect, universally loved food item with an imperfect definition. While philosophy professors have their own way of addressing what constitutes a sandwich (you might want to comb through Kit Fine’s paper on the metaphysics of a ham sammy, for good measure), our legal system tells us another set of contradictory rules that will classify a burrito as one for tax purposes. The technicalities can lead you down a never-ending rabbit hole: Is a KFC DoubleDown a sandwich if it has no bread? What about something rolled, like a gyro? 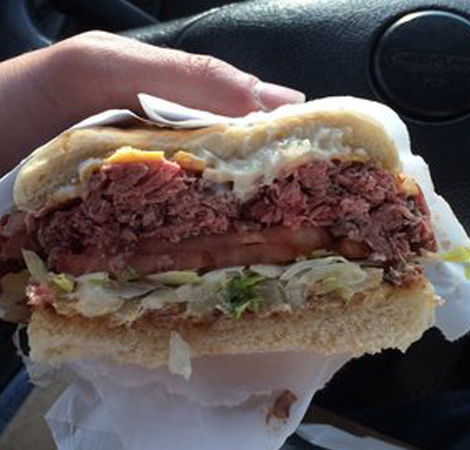 Or a hamburger? Or hot dog for that matter? I’m certainly not the first one to have asked these questions. 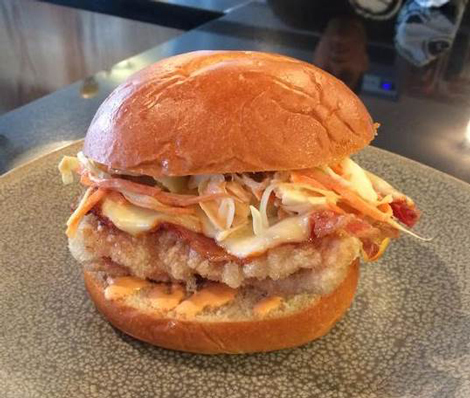 But we’re not here to split rolls hairs—the purpose of this exercise is to revel in the glory of sandwich-hood and all it has to offer, from local specialties that stoke regional pride, to contemporary riffs that improve upon our favorite classic combos. To get you started on your life-long quest for hoagies, bánh mì, and the like, we rounded up a handful of editors, chefs, writers—including one sandwich-blogging NBA champion—for their bread-and-filling wisdom. 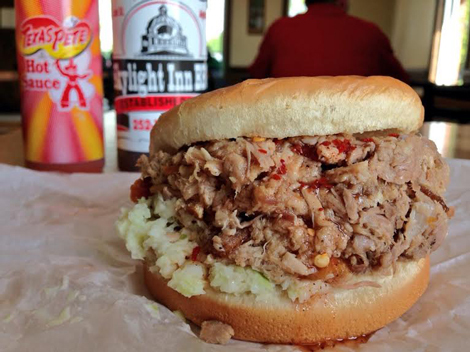 Vaughn says: “A 90-minute drive from the nearest major airport is required for most Americans who want to enjoy a chopped pork sandwich at Skylight Inn in Ayden, North Carolina—the home turf of the barbecue sandwich. Cash on the lacquered wood counter is required for all, but the $4.50 price tag is more than reasonable. “You want slaw on that?” Yes. Yes, I do. A kid in a camo hat (probably in his mid-twenties, but I’m getting old) takes my money and makes change from a pile of bills and coins behind him. No register, adding machine, or point of sale system required. Dimayuga says: “When I moved to New York City to start working in kitchens almost nine years ago, the places I worked at dictated my day-off food cravings. If I was cooking French or Italian, it meant I was craving Chinese food. That changed when I went on to open Mission Chinese Food and Mission Cantina. It’s solidly been either Japanese or Italian American since then, but it’s East coast Italian-American that really hits the spot. It was something I never had direct access to in California. My girlfriend, who was raised outside of Atlantic City, turned me on to her favorite sandwhich shop ever: White House Subs for their famous Italian sub. Built in 1946, it’s a diner frozen in time. The exterior of the shop looks like a iced cake in a beautifully patriotic red, white and blue, and the neon sign boasts the restaurant name and an eight-foot neon sub. I love all the details: the orange and white vinyl booths; the ribbed, 60’s stainless kitchen walls and hood; Sinatra’s sweat soaked towel used in his last show in A.C., immortalized in a boxed frame amongst all the other photographs of famous people that have passed through. Bissonnette says: “A smart person once told me, “It’s hard to find a truly bad bánh mì.” I thought about this and realized that they are totally right. 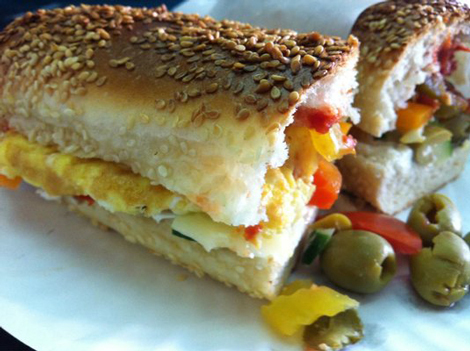 When I went to Vietnam on an eating trip, I never got sick of bánh mì or iced coffee. I loved that the best bánh mì were at kiosks, or carts on side streets, or behind the bus washing lot in Ha Long Bay. 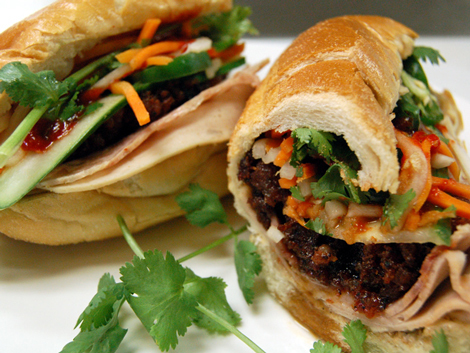 There are plenty of wicked good bánh mì all around most cities, true. But the experience of walking into Saigon Sandwich Shop in the former Red Light district in Boston is so much like finding an abandoned lot with someone making scrambled egg bánh mì in Vietnam—save the long flight. Song says: The first time I went to Au Cheval, my friends and I were blown away by how unabashedly go-for-broke, crazy delicious the food was—from the enormous roasted marrow bones with piping hot beef cheek marmalade and buttery toast, to the prime beef single (meaning, two patties) cheeseburger topped with fried egg and thick, peppery bacon. Still, in my mind, there is no greater example of their over-the-top attitude towards food than their take on the old brown-bag staple, the fried bologna sandwich. 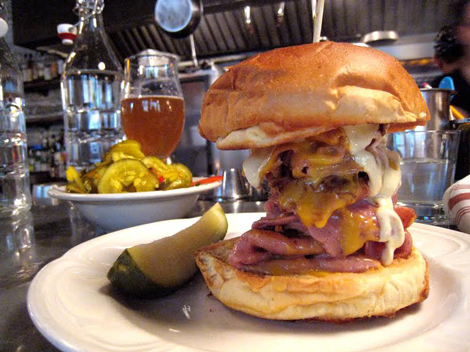 Piles of paper-thin, pepper-speckled, house-made bologna are griddled on the flat-top until golden-brown, topped with melted American cheese and a simple dijonnaise sauce of mustard, mayonnaise, and lemon, perched tremblingly atop a perfectly browned bun. 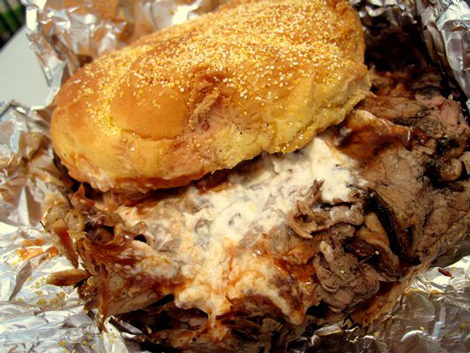 The result is a giant, gorgeous, gravity-defying stack of meat and cheese, dripping with sauce and juices. 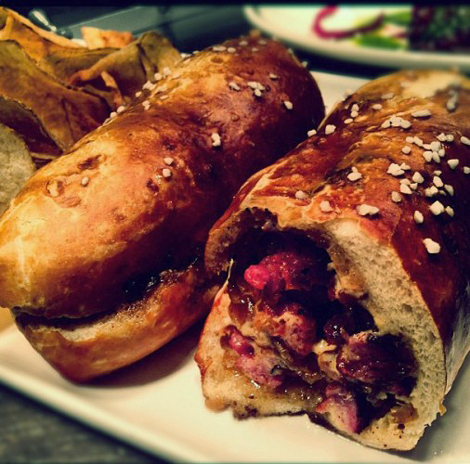 House-made sweet bread-and-butter pickles go beautifully with this sandwich, adding a crunchy texture and sweetness that cuts through and complements each salty, porky, chin-dribbling bite. 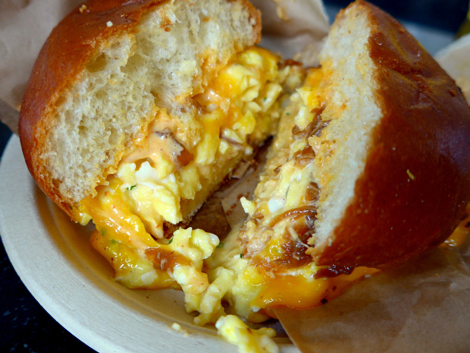 I make a mess every time I eat this sandwich, squishing it into submission and stuffing it into my mouth with abandon. 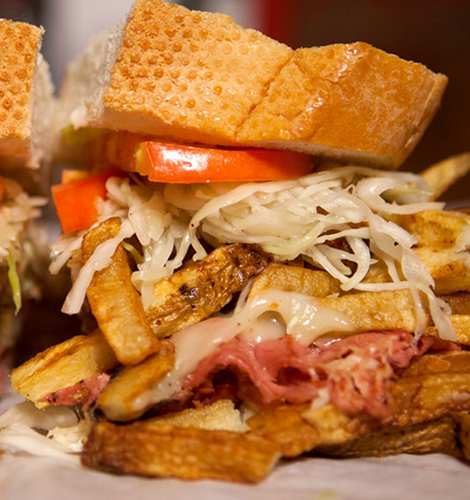 Scarano says: “This is to make amends: The first time I tried to write about that beloved and semi-famous Pittsburgh experience, the Primanti Brothers sandwich, I was in a high school creative writing class. I committed the amateur hour mistake many bad writers commit when describing something they think they love but are at a loss to understand: I likened it to jazz. And free jazz at that—oof. But the men and women at the original Primanti Brothers location (in Pittsburgh’s kinda dingy but entirely loveable wholesale food and Steelers apparel neighborhood, the Strip District) don’t make jazz. They make sandwiches, and they make them efficiently and likely not according to the latest health codes. Maybe sometimes they’ll use gloves when they handle your food, sometimes they won’t. They’ll speak with Yinzer accents in varying degrees of gruffness, from a casual yinz to a nasally dahntahn. 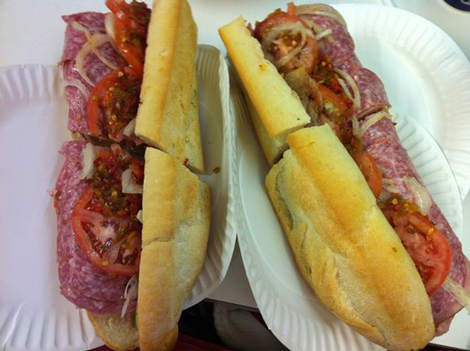 Their moves are practiced—the stack of thick capicola hitting the grill, the provolone cheese following soon after to melt atop the spicy, fatty protein in gooey strands. The thick Italian bread, supplied by Mancini’s Bakery, waits by the grill. The bread is never toasted so that it can conform exactly to what it contains: meat, cheese, tomato slice, peppery vinegar-based cole slaw, crisp French fries. The textures are as diverse as the temperatures and flavors. 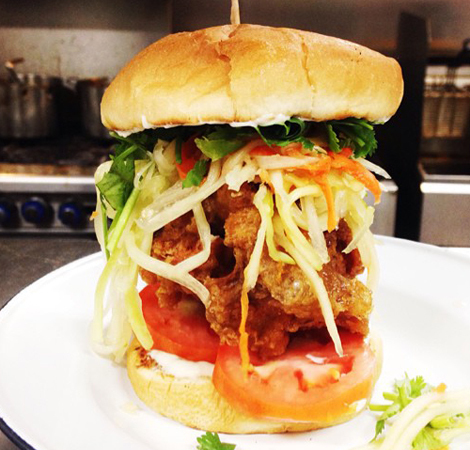 The layers of cap’ retain heat (and pack a pleasantly sharp bite), which contrasts with the cold slaw and tomato. Each bite will have you flushed and satisfied—unless you obsess over calories, in which case someone can point you to the door with the neck of their Iron City. Bolois says: “What is it about Bunny Bread that inexplicably calls my name? 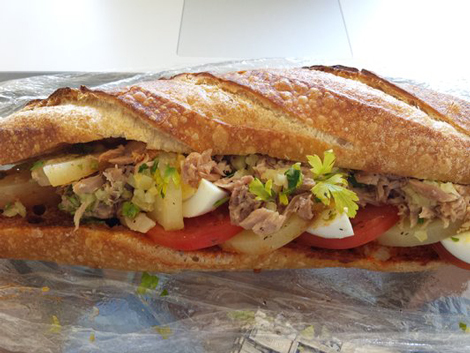 It’s certainly a far cry from the crusty French bread that the 100-year-old Leidenheimer baking company supplies to po’boy shops all over town. But when I returned home to Los Angeles from Jazz Fest back in 2013, all I could think about was an image of Al Green on stage throwing roses into the crowd, and this white, processed loaf I had never heard of before—a Midwest-Southern equivalent of Wonder Bread. My grain-bowl worshipping friends thought that was a totally dumb thing to obsess over, and admittedly it felt sort of dirty, especially in the context of other bread-and-filling icons like the muffuletta and po’boy. I first learned about it at Casamento’s, a time-honored restaurant on Magazine street that shuts down for three months during the summertime (go figure). 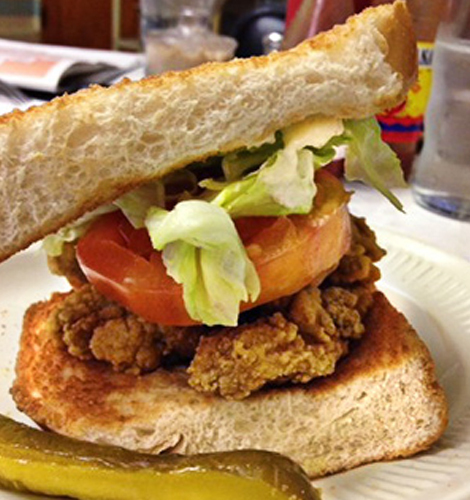 There, the bread forms the backbone of their oyster loaf sandwich, a distant—and somewhat neglected—cousin of the po’boy. Toasted, chewy, and sliced thick, the bread is slightly sweet—reminding me ever so slightly of Japanese milk bread—and acts as a brilliant foil to the pool of salty juices spilling out of the fried Gulf oysters, which are dredged in corn flour to give them a more robust crunch. A schmear of mayo brings it all together. This year I missed seeing the Reverend belt out “Love and Happiness,” but I really missed that damn Bunny Bread too.